Your powerful (green) flashlight… From low to high in power and repetition rate. Most of the time, our costumers rely on Quantel and Amplitude Lasers. However, other manufacturers are available as well. The right choice of Laser depends on your case. While some have higher power, others are faster... In addition, not every camera /laser combination can be recommended. As we obviously don't built lasers ourselves, we rely on the expertise of our friends. Therefore, we are able to offer you the latest in PIV Laser technology available on the market. 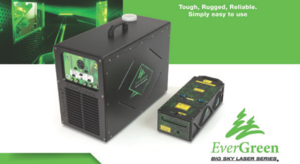 The EverGreen is a dual pulsed laser for PIV applications with a choice of pulse energies and repetition rates. The system consists of a single laser head with a single power supply. The EverGreen delivers a perfect combination of precisely overlapped beams in a rugged, compact package. Diode-pumped Nd:YLF laser from Amplitude offer the ultimate in flexibility for PIV and other dual output applications. The combination of two independent oscillators allows complete control of pulse separation and pulse energy. Both oscillators in the Terra PIV system are identical in optical design giving temporally and spatially matched pulses for the highest degree of cross-correlation. Each oscillator can be independently triggered via TTL inputs.